Axis forces (Germany, Italy, and Bulgaria) occupied Greece from 1941 to 1944. The unimaginable hardships caused by foreign occupation were compounded by the flight of the government days before enemy forces reached Athens. This national crisis forced the Church of Greece, an institution accustomed to playing a central political and social role during times of crisis, to fill the political vacuum. Led by Archbishop Damaskinos of Athens, the clergy sought to maintain the cultural, spiritual, and territorial integrity of the nation during this harrowing period. Circumstances forced the clergy to create a working relationship with the major political actors, including the Axis authorities, their Greek allies, and the growing armed resistance movements, especially the communist-led National Liberation Front. In so doing the church straddled a fine line between collaboration and resistance--individual clerics, for instance, negotiated with Axis authorities to gain small concessions, while simultaneously resisting policies deemed detrimental to the nation. Drawing on official archives--of the Greek Ministry of Foreign Affairs, the British Foreign Office, the U.S. State Department, and the Greek Holy Synod--alongside an impressive breadth of published literature, this book provides a refreshingly nuanced account of the Greek clergy's complex response to the Axis occupation of Greece during World War II. 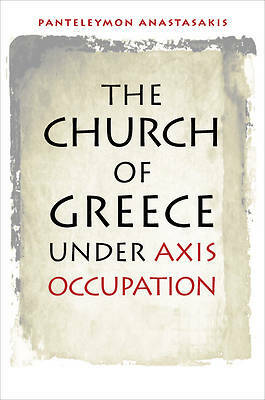 The author's comprehensive portrait of the reaction of Damaskinos and his colleagues, including tensions and divisions within the clergy, provides a uniquely balanced exploration of the critical role they played during the occupation. It helps readers understand how and why traditional institutions such as the Church played a central social and political role in moments of social upheaval and distress. Indeed, as this book convincingly shows, the Church was the only institution capable of holding Greek society together during World War II. While The Church of Greece under Axis Occupation elucidates the significant differences between the Greek case and those of other territories in Axis-occupied Europe, it also offers fresh insight into the similarities. Greek clerics dealt with many of the same challenges clerics faced in other parts of Hitler's empire, including exceptionally brutal reprisal policies, deprivation and hunger, and the complete collapse of the social and political order caused by years of enemy occupation. By examining these challenges, this illuminating new book is an important contribution not only to Greek historiography but also to the broader literatures on the Holocaust, collaboration and resistance during World War II, and church-state relations during times of crisis.